Several years ago, when I lived in a cozy one-bedroom on Coventry Road, I didn't pay for internet. It wasn't a careless neighbor who didn't password-protect the router. I was able to access the internet through OneCommunity, who offered free wireless coverage throughout the greater University Circle area and beyond. 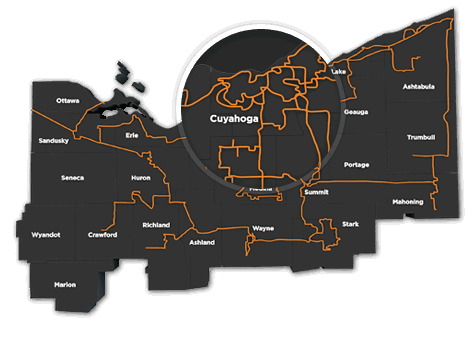 OneCommunity started as a nonprofit organization with a big vision, back in 2006--working toward turning the greater Northeast Ohio area into a "smart region," one dedicated to the growing community of technological innovators in the area. OneCommunity now services over 2,000 miles of fiber across 24 counties throughout the region, a $100 million investment. It has connected over 2,300 public institutions to its network over the last eight years. OneCommunity delivers up to 40gb/s in speed with an extremely robust infrastructure and 24/7 network service. Now it has bigger plans to serve the region by offering service to private businesses. It has launched a component called Everstream to service local businesses at competitive rates, and even offers tenant in multi-office buildings the ability to share the service and split the bill. Soon, also, local residents may be able to purchase the service. A pilot program in Shaker Heights is being launched near Shaker LaunchHouse, a highly successful business incubator, venture capital resource, and entrepreneur support shop. Back in September, OneCommunity announced that it was endeavoring to create the state's first "fiberhood" on nearby Chelton Road, whose lots are adjacent to the LaunchHouse headquarters. Chelton Road is a depressed area of Shaker Heights with many sub-50k home values, so it is going to be a very interesting case study for determining how technological upgrades can impact a community. We may have to wait a few years for this, but I am optimistic that this neighborhood will change dramatically over time. Read more about the fiberhood at http://www.cleveland.com/business/index.ssf/2013/09/shaker_heights_is_getting_a_fi.html.